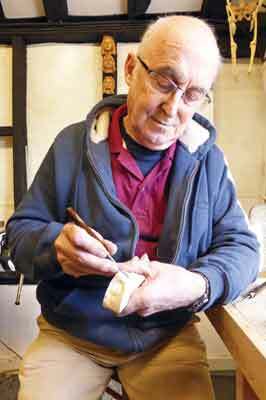 This is probably at the top of the list of problems that carvers face, at least most hobby carvers, and although it has been covered several times in previous articles, I feel that it bears repetition in a little more detail. The answer to the problem of carving eyes can be prefaced by two more questions. Do you really need to carve eyes at all? And, if you do, are you carving human or animal eyes? Let us look first at dealing with human eyes. To be perfectly honest, if a carving has a head that is less than about 25mm in height, then you are asking for trouble if you try to carve detailed eyes. What you really need is a way of showing the eyes as being alive and possibly looking in a particular direction. This can be done fairly simply without trying to carve an eye in detail. Often just a simple line or a pair of lines is more than adequate and will certainly look a lot better than a pair of ragged holes dug out of a face. If you have your subject looking down you don't need to carve eyes at all. 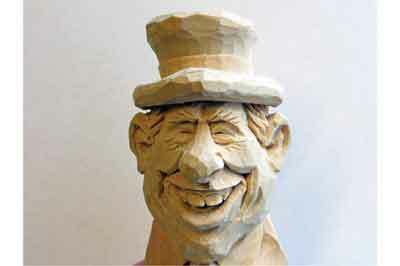 The photos here are examples of small practice caricature head carvings by my good friend Pete LeClair from the USA. Each of these could look equally effective in any style of carving. Note how deep the eyes are in the face and the rough dome shape into which they are carved. 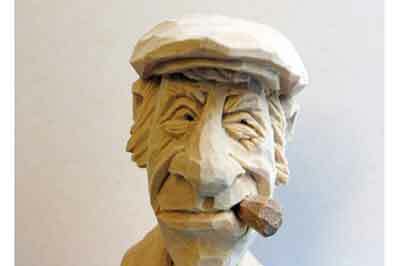 Obviously, as they are caricatures the eyes are closer together than you would see in a normal carving but this can easily be adjusted to suit your carving. Any face that is larger than 25mm high is, in my opinion, suitable to try and carve a fairly realistic eye but just think about the following observation. How many faces have you carved? Double this and you will have the number of eyes you have carved. Do you really think that you can expect to perfect the carving of eyes with this amount of experience? It is almost like expecting to drive a car after two or three lessons. 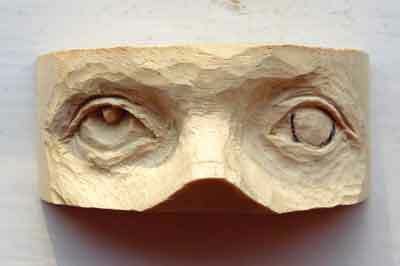 The solution is simple - practise carving eyes until you are confident that you can do it on your precious carving. 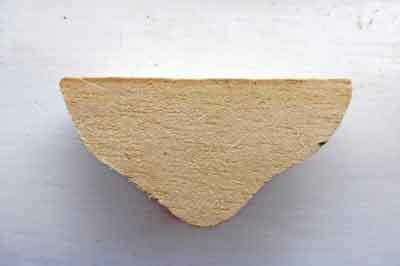 Below I show a method of doing this that you might like to try - I suggest that you choose a piece of waste wood, similar to that you are using for your carving, and cut it out as shown. You might like to start with a piece that is larger than your actual carving and then reduce it later for your final practice. 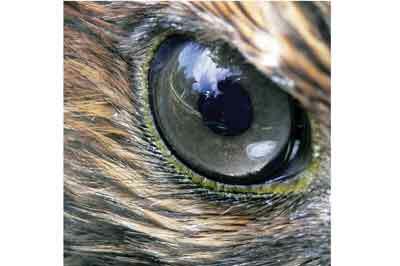 One piece of information that you should bear in mind is that the face at the eye line is five eye widths wide. This means that you have the two eyes, an eye width between them and one eye width outside each eye. 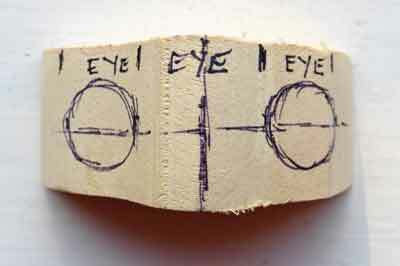 On your block you just need to draw the two eyes as circles with one eye width between. Remember that the eye is basically a sphere, in humans about the size and shape of a table tennis ball. Your aim now is to establish a mound within the circle but leave the top outside corner of each eye, as to remove the fullness here will make the eye look old. Carve deep around this circle, especially underneath and by the bridge of the nose making the bottom of the circle deeper than the top and blend in. Mark in the outline of both eyes doing your best to match the shapes. 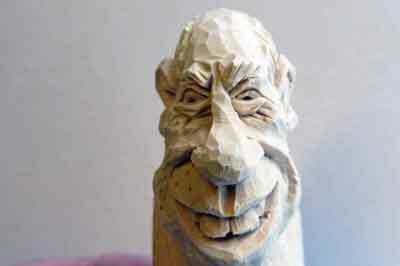 When you are happy with your drawing you can start to carve. Any further shaping of the eyes should be done on both eyes together, step for step. Carving one eye and then trying to match the second is extremely difficult and usually results in eyes of different shapes. Before moving on you will need to shape the brow and bridge of the nose remembering that the female brow has no brow ridge where the male has a pronounced ridge around the inner end of each eyebrow. Carving the eyes involves cutting round the lines you have drawn and removing the material from within these lines to an equal depth. I liken this to drawing the eye on the surface of an orange and then cutting out the peel revealing the shape of the orange itself. You will notice that the curvature of the surface revealed is the same vertically as it is horizontally. You must do the same on your carving otherwise you end up with an almond-shaped eye. 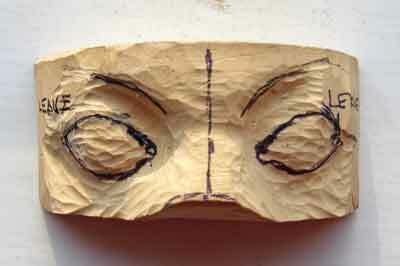 In the photo for step 5, both eyes have been carved like this with one having the iris marked in and the other with one suggestion of how to deal with showing the iris. You could just outline the iris with a shallow cut if preferred or cut back the rest of the eye surface leaving the iris proud. It is important, to prevent the eyes from seeming to stare, that there is some shadow on the top of the open eye from the top eyelid. This means that you actually need to cut quite deep. 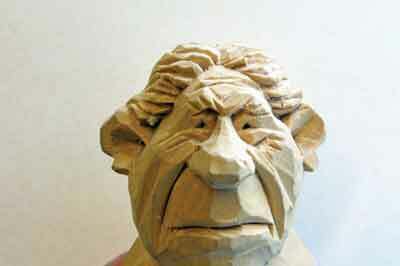 Most carvers are reluctant to do this in case they 'mess it up'. Be bold! If you wish to carve caricatures there is nothing to stop you from painting the eyes to get a more realistic result but I haven't yet seen this done effectively on a realistic face. If you want to carve eyes on an animal carving the basic procedure is more or less the same but you have a few considerations to bear in mind with the different kinds of animal. You do, however, have more options to get an effective result. 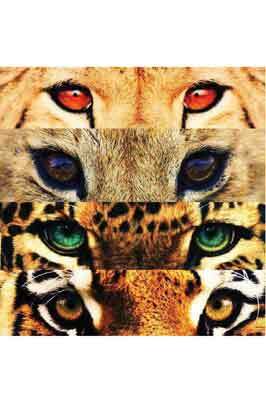 First of all you need to understand the difference between the eyes of a hunter, or predator, and those of a prey animal. All you need to do is ask yourself if the animal you're carving is a carnivore or herbivore. Hunters are carnivores and catch prey to live. Therefore they need eyes that are placed facing forward, so that they can focus on their prey, or that can be moved into that position. In general, you will find that a high proportion of these will also have protective brows with the eyes set fairly deep within the sockets. The herbivores or grazers don't have the same requirement as they are basically eating grass or vegetation but do need to be constantly aware of what is happening around them. Their eyes are, therefore, set on the side of the head, usually bulging quite prominently, giving them a wide range of vision. This is often helped by having elongated pupils. In general, you will be able to see their eyes from the back as they need to see behind them so, when carving them, this should be kept in mind making sure that any parts of the head do not obstruct this line of vision. 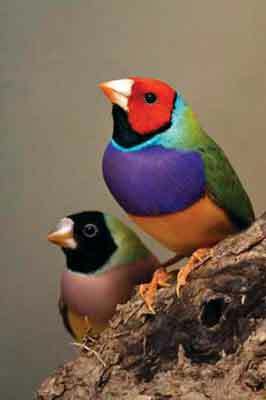 Very obvious examples of these are songbirds and ducks, rodents, rabbits, cattle, antelopes and deer. As long as you bear these differences in mind, you will not go far wrong. Although these animals have eyelids they are not very prominent but the shape of the eye itself is important and this needs to be studied before you start. 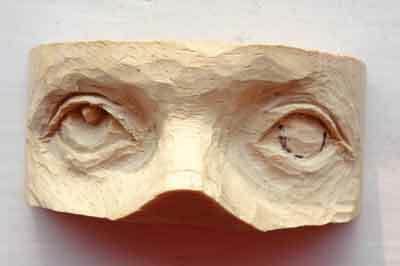 If you are painting your carving you can, of course, use glass eyes but you will need to add the eyelids with modelling putty and then paint them. What, then are the alternatives? With larger heads you can carve the eyes in much the same way as for humans and probably the most effective way to finish these is to paint them with acrylic paint and then coat with a drop of clear nail varnish to give the shine. With care this can make an eye that is as good as a glass one but the correct shape. For small carvings where it is difficult to carve the eye successfully, you can always try inlaying the eye with a variety of materials. The simplest of these is a small piece of buffalo horn that is readily available. This can be shaped into a thin dowel the size of the eye you want and the head drilled to accept this. It is advisable to drill a fitting hole the same size in a separate piece of wood in case the dowel breaks during the process. You donâ€™t want this breaking in your finished carving. Once the size is correct, put the end of the dowel into the hole with a little CA adhesive and trim and polish when secure. 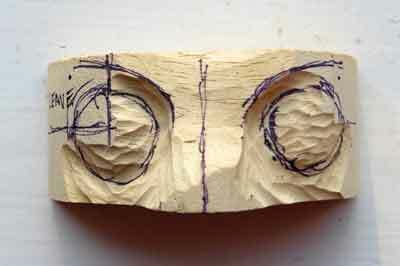 Should you want to do this with a larger carving where you want the eye to be two different colours â€“ iris and pupil â€“ you can do the same thing but in two stages. I have successfully used amber or artificial amber with the pupil in buffalo horn. You make the initial dowel in the amber and glue that into the hole and then drill for the pupil once it is fixed. There is a simpler way to get the same effect and this is to shape your amber dowel and create a small round dimple in the end. This can be blackened with a fine marker pen and then placed in the hole with the dimple on the inside. When polished this will show through as a pupil. If you don't have any amber or are not successful shaping it you can use a piece of clear acrylic and shape it in the same way using the ink pupil if you prefer. You can then insert a small piece of coloured foil - sweet wrappers from some popular selections are ideal - the hole before fitting the eye. This will shine through giving a very bright eye of the colour you want. Obviously, this method will give your animal a round eye but with a little practice and ingenuity you can do the same thing and shape the eye as you want. You will, of course need to shape the hole as well.